Thomas is commonly known as “the father of Springwood.’ He was born in Tipperary Ireland about 1810 according to the age recorded on the passenger list for the Strathfieldsay on which he immigrated to Australia with wife Mary Ann and daughter Mary in 1838. The following year Henry Parkes (later Sir) travelled to Australia on the same ship. This is said to have created a link between the two men leading to friendship in later life. Thomas and Mary were Catholic and literate, and he brought excellent references from Sir P.P. Carrol and others. Joseph Jackson wrote that the Boland family went to Bathurst where Thomas was said to have been overseer manager for the Ranken family as well as overseer in a cheese factory. However, his obituary in the Nepean Times 30th March 1889 stated that he worked in Bathurst for Perrier Brothers. The Perriers and Rankens were early pioneers in the Bathurst district. 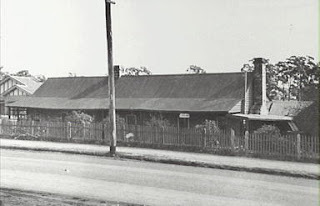 He is recorded as holding the license for the Bathurst Traveller 1841-4 also known as the Weatherboard Inn at Weatherboard (now Wentworth Falls). In 1843 he is shown as holding the publican’s license for the Trafalgar Inn, Honeysuckle Flat, a district of Bathurst. He was appointed superintendent of road gangs at Springwood following his move from Bathurst. In 1847, the land on which the second military barracks had been built was sold to Robert Martin, who sold it to Thomas Boland the same year. The 20 acre site contained a slab hut with three bedrooms, a sitting room, pantry, detached kitchen, storerooms and stables. There was a garden well supplied with water from a dam. Thomas, with inn-keeping experience and time spent working on the western road, could see the need for an inn to serve travellers. He consequently built the Springwood Inn, often known as Boland’s Inn and held the license in 1857. Daughter Alice recounted visits made to the inn by Sir Henry Parkes, Sir James Martin and the Hon. W.B. Dalley. Caroline Chisholm, with bands of young women immigrants also stayed at the inn. Large numbers of Chinese camped in the ground adjacent on their way to the goldfields. This is an abbreviated version of a larger article found in The Making of a Mountain Community: a Biographical Dictionary of the Springwood District, 2002. Joseph Jackson Papers, Blue Mountains City Council local studies collection, vertical files. Nepean Times, 30th March, 1889.